Neil Armstrong was memorialized today in a private service held by his family in Ohio. Memorials are also being held around the country, including events at the Smithsonian Air & Space Museum, Kennedy Space Center in Florida, and the US Space and Rocket Center in Huntsville, Alabama. The first man on the moon died on August 25, at 82, from complications of a cardiovascular procedure. The loss of this American hero has been felt keenly around the country and the world, prompting responses not only from everyday citizens but also from President Obama, who proclaimed that flags fly at half-staff on the day of his burial, Charles Bolden, the current NASA administrator, and his fellow astronauts and colleagues. In a YouTube statement, Charles Bolden said, "Neil will always be remembered for taking human's first small step on a world beyond our own, but it was his courage, grace and humility before during and after his historic Apollo 11 mission that has continued to lift him and all of us far beyond that breakthrough achievement." Apollo 11 lunar module pilot Buzz Aldrin said in a separate statement, "Whenever I look at the moon it reminds me of the moment over four decades ago when I realized that even though we were farther away from Earth than two humans had ever been, we were not alone....I know I am joined by millions of others in mourning the passing of a true American hero and the best pilot I ever knew....I had truly hoped that in 2019, we would be standing together along with our colleague Mike Collins to commemorate the 50th Anniversary of our moon landing." The Armstrong family also released a pair of statements. Upon his death, they expressed the following: "Neil Armstrong was also a reluctant American hero who always believed he was just doing his job. He served his Nation proudly, as a navy fighter pilot, test pilot, and astronaut. He also found success back home in his native Ohio in business and academia, and became a community leader in Cincinnati." To that end, the Internet has responded with Wink at the Moon Night, to be marked on August 25th of every year. 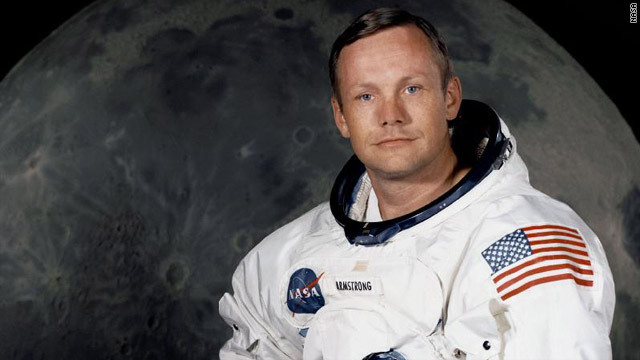 For those wishing to honor Neil Armstrong's memory, his family released a list of organizations that they believe are worthy of such an honor, including the American Institute of Aeronautics and Astronautics and the Cincinnati Children's Hospital Medical Center, saying "The outpouring of condolences and kind wishes from around the world overwhelms us and we appreciate it more than words can express." I remember watching Neil Armstrong take his historic step on the lunar surface at the ripe old age of 6 and how I wanted to be an astronaut. I remember watching it all from lift off to splash down. Thanks for the memories and the One Giant Leap for Mankind Neil, R.I.P..
God Bless you Neil Armstrong for keeping us on the edge of our seats for so long . Your humble, talented exploits we will never forget, and your star shines bright in the heavens with your arrival. Life`s work done now may you rest in peace. After the Chicago Cubs collapse in 1969, the only thing that made me happy that fall was the ticker tape parade for the Apollo 11 astronauts in downtown Chicago. I was working on a project at Purdue University in the late 70's and I met Neil Armstrong who was visiting a classmate that taught at the unversity. He asked me if I wanted a "poor man's cup of coffee" which he was reheating in a microwave. I started jumping up and down and screaming like a girl at a Bieber concert when I realized who he was. We talked, I got his autograph, and I will always remember how gracious he was to this college freshman. Rest in Peace Neil Armstrong. You were just a man, but your legacy will be remembered by mankind. God bless you Son of America. Thank you for having passed this way. What were you doing when Man first stepped on the moon? My wife and I wanted to remember it so we were making love on the living room floor in front of the TV! hahhaha At least we did something we would remember. God BLess you Neil Armstrong...may your star shine in the Heavens forever. God Bless America.!!! God bless you Neil. You are truly one of Americas greatest heros. My sincerest respects to his family. I'm sorry for his passing. But honestly I feel robbed. This man was one of our greatest American heros. He deserved a state funeral. To deny the country the opportunity to honor him and his family is very sad indeed. I can understand a desire for privacy and respect it but regret that the country had no opportunity to mark the occasion to thank him for his immense and incredible service to the US, to science, to mankind. The man should be given a tomb fit for the thousands and even millions of future visitors who will one day want to pay homage to the man who first stepped on the moon. In hundreds of years, people will still be exploring space, and will also want to visit such a pioneer. 1969 was the best year of my life. At 20, I arrived in America in January as an immigrant and in July i was priveledged to witness the landing on the moon by Appollo 11 astronauts. At 64, I still have Neil Armstrong's picture in my bedroom. The first man to walk on the moon was my hero. I cannot express the pride I had to be in this country. I was drafted in the military in 1970 and proudly served my country. Being in New York since 1969, I also celebrated that year the football and baseball champions The Jets and The Mets. What a year!! Welcome to the US. Thank-you for your service to our country and for sharing your story (even though I'm an Orioles and Baltimore Colts fan : ). Indeed I'm very thankful to hear such stories as yours. What you have experienced and accomplished is something most of us natives of the States take to far for granted. Thanks so much for your service, I'm honored to be an American with you. I know of no one more humble or classy as Neil Armstrong; rest in peace Neil.